19 May Love your lawn? One of the questions we always ask our clients at the outset is about their attitude to a lawn in the garden. Many still consider the lawn to be the principal requirement of a garden, a fundamental centrepiece to which other elements take second place. A beautiful expanse of lawn has always seemed ingrained in the British psyche. But increasingly we are designing and building gardens with a lawn being but one of several other elements, reduced in size and significance. Why would this be? 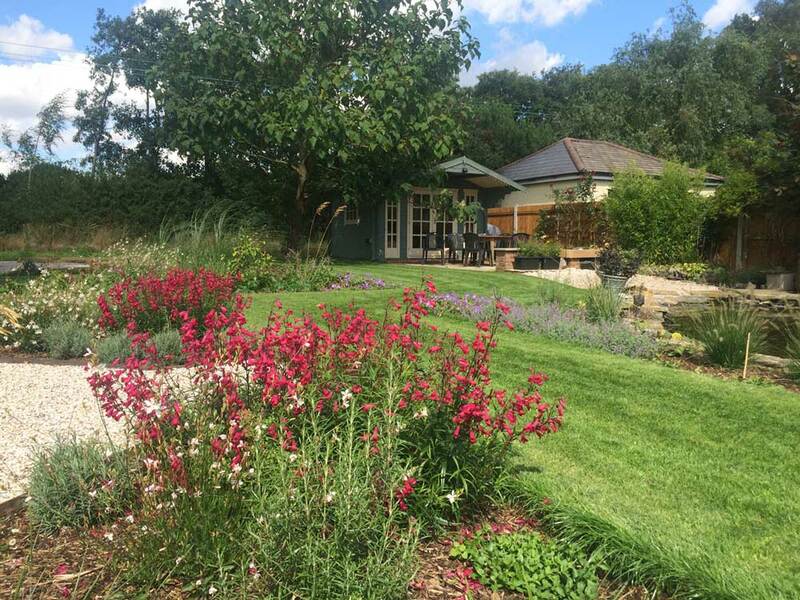 It’s true that when you engage the services of a professional garden designer or landscaper your eyes will be opened to the full range of landscapes available, from differing hard surfaces, larger planted beds and borders and alternative focal points. But mainly, I think, people are admitting to themselves that maintaining a lovely looking lawn is an awful lot of work. With the time, effort and dedication required for the regime of weeding, feeding, mowing, scarifying, aerating, top dressing and repair, you can perhaps understand these feelings. All lawns need sunlight, moisture and good drainage. Yet the very act of using the lawn how it is intended compacts the soil and reduces drainage. Here in the drier east of the country, lots of lawns are now looking yellow well before midsummer. But who says you need a lawn anyway? Look at the famous gravel garden at Beth Chatto’s gardens near Colchester. Wide gravel paths flow through the large planted beds like a river with plants spilling over the edge. Gravel is an excellent substitute for grass for drainage properties and it is economic to install. And thoughtfully laid paving can make small gardens into attractive courtyards, using soft landscaping pockets to soften the effect. And of course there is always artificial turf, which although much more expensive to lay, is becoming the answer to a lot of homeowner’s issues. It is much improved now in appearance and texture and its benefits are hard to deny. Those with active kids will appreciate its resistance to tough wear and tear, and the fact that they can get back out there soon after a shower. No more mud traipsed through the house either. It is a perfect solution for those physically unable to manage the demands of a real lawn, and also for gardens unoccupied for some of the year such as holiday lets. Gardens with unconducive environmental factors such as excess shade or wet would also benefit. Some will shudder at the prospect, some will love it. But it’s certainly good to have options.